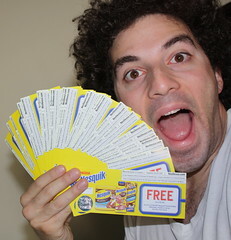 Yesterday in the mail, I got my 50 free bottles of Nesquik coupons. A couple months ago I did my video entry to the Nesquik contest and I think the top 40 entries were given this prize? Something like that. The top ten were the finalists and the top one got $10,000 I think.